Perfect for summer, this Goat Cheese and Asparagus Pasta is healthy, delicious and so easy to make. The goat cheese and basil make for a lovely sauce over the high fiber pasta. And the touch of lemon adds just the right kick to bring it all together. You can easily bulk up this Weight Watchers pasta recipe with more vegetables, if you’d like. In fact, the next time I make it, I may use half the pasta but add in some zucchini and/or broccoli, and then increase the amount of goat cheese. But if you are really craving those carbs, the recipe is fantastic as is. It’s really a very versatile pasta dish and the possibilities of what you can do with it are endless. And it’s such an easy summer recipe that doesn’t take much time or effort. 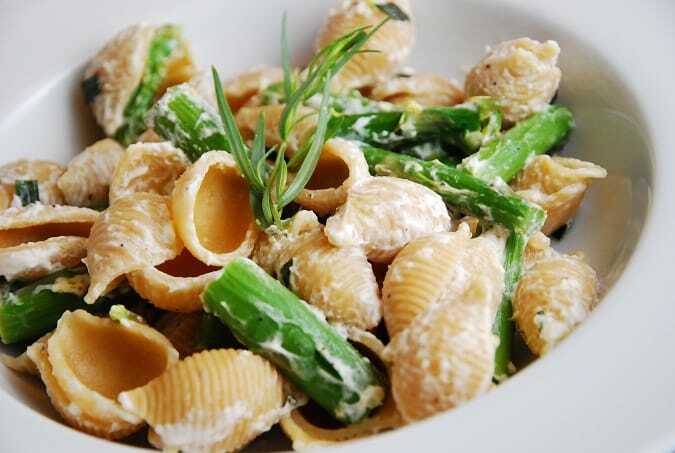 This lively summer pasta recipe has it all…creamy goat cheese sauce over high fiber pasta and fresh roasted asparagus. And it’s all highlighted with a bright lemon-basil essence that is just divine. Prepare pasta according to package instructions. Preheat oven to 425 degrees. In the meantime, line a baking sheet with aluminum foil and mist with non-fat cooking spray or an olive oil mister. Place asparagus and garlic on the baking sheet and then mist it with the cooking spray or olive oil mister. Season with salt and pepper. Place in oven and roast until asparagus is slightly tender, about 10-12 minutes. Drain pasta and reserve 1 cup of pasta water. Place hot pasta into a large bowl, and add in goat cheese (breaking it up as you put it in), olive oil and lemon zest and lemon juice, along with a tbsp or two of the pasta water. Stir to combine. Now mix in basil, roasted asparagus and garlic, and toss to combine. Season with additional salt and pepper. Serve immediately.